The Fairthorpe story starts with an outstanding man - Air Vice Marshall D.C.T. Bennett CB, CBE, DSO. In the early 1950s, despite still being a young man, he had become a world wide authority on air navigation with published reference works; was the youngest A.V.M. in the Royal Air Force; founded an airline and was the first pilot to fly his commercial aircraft out of Heathrow after the war. He had also been a member of parliament. Then he decided that he wanted to build cars. After setting up a factory in the middle of Chalfont St Peter, Bucks, his aim was to build a car for the younger person with sporting pretensions that would do sixty miles an hour and sixty miles per gallon. In the mid fifties fibreglass was in it’s infancy and everyone was learning how to work it including Don Bennett. His first attempts at car manufacture produced what we today would call a microcar, seating just two people and using a motorcycle engine in the rear. It was called the ATOM but perhaps did not go like one. The Excelsior two stroke, BSA 250cc and Gold Flash 650 engines were options but despite a great deal of development work and export orders from America, the car was not a great commercial success. With the arrival of a new general manager, John Green from Daimler in Park Royal, things began to change. He had very different standards of engineering than those practised at Fairthorpe and he set about improving on the theme of small low cost cars by working on the ATOMOTOR a front engined vehicle using a very clever adaptation with BSA 650 motor cycle engine coupled to a STANDARD 8 gearbox. This car appeared at the 1957 Earls Court motor show. As of 2005 only one is known to exist. At this time the engine to die for in terms of performance was the Coventry Climax 1098 cc which produced between 75 and 100 horsepower depending on state of tune. This was far in excess of the 30 or so the motorcycle engines produced and Don Bennett set about making a suitable car for this unit. He just happened to have a chassis laying about the factory that was probably made by an earlier manager called Ken Lowe - who went on to make cooling fans for all makes of cars known as Kenlow fans - and this was pressed into service. 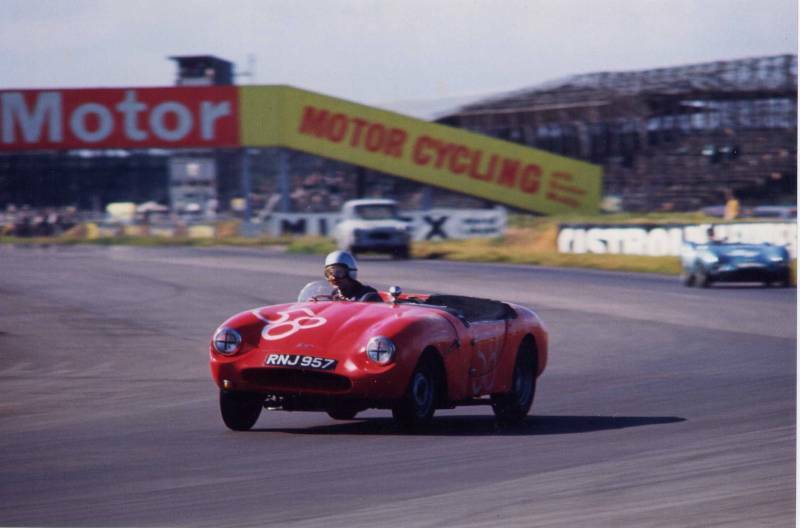 Rather than make his own body he went to a well known maker of fibreglass shells in south London called Microplas, purchased a rather attractively shaped body and fixed it to his chassis, complete with Coventry Climax engine. 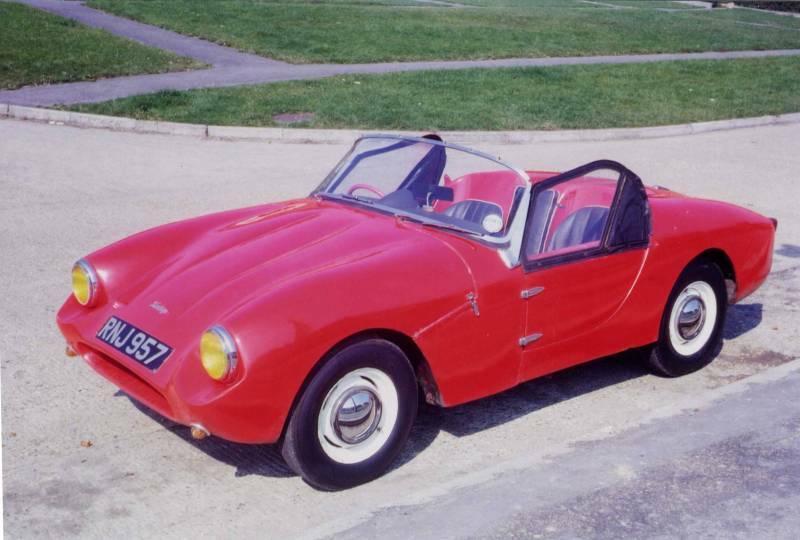 The result was the Fairthorpe Electron, a very fast two seater car that was economical and handled well. The downside was the expense of the Climax engine which made the whole package about the same price as a production car which had a better quality finish. For the racing motorist however this did not matter and quite a few were made, including exports to America. In motor racing they were quite successful because as a true road going racer there was little to compete with it. However back at the factory things were happening. In the back of the workshop out of Don Bennett’s sight a chassis designed by John Green was taking shape, which would change the fortunes of this little company. Having completed the chassis and body Green had to come clean when he needed to spend money on the engine. Bennett was annoyed but approved the purchase of a Standard 10 engine and thus began the success of the Electron Minor, the name by which Fairthorpe is mainly remembered. This car had remarkable roadholding, was economical and fast. It had two comfortable seats and a large boot with a ten gallon petrol tank. Initially offered as a complete car, the major breakthrough came when it was discovered in 1959 that if you made it yourself from a kit you did not pay purchase tax. You could therefore buy this wonderful little package for as little as £450. The company sold over 500 during the next few years. The Minor was developed further to cater for independent rear suspension, widening of the chassis to accept Triumph wishbones at the front and the Ford range of engines plus various nose shapes on the body. These were reflected in the marks 2, 3, 4, 5, and 6. However with the arrival of cars like the Austin Healey Sprite and MGA, customers had moved on to competitively priced production cars and the market dried up. Another significant endeavour was the Fairthorpe Zeta, although it had a very short production life. It consisted of a strengthened Minor chassis with a different nose shape, but above all the motive power came from a Ford Zephyr 2.5 ltr straight six engine tuned by using six Amal carbs, a good exhaust system and an option of the aluminium Raymond Mays head. This car had a considerable reputation for speed providing it was in a straight line, but when you put a big, heavy, cast iron engine in the front of a light car other major chassis changes are needed and these were not forthcoming. It is thought that no complete cars of this type exist today but there are one or two chassis laying around. Don Bennett’s son, Torix was interested in doing something in the car world and started his company called Technical Exponents to make cars which were small GT types using mainly Triumph underpinnings. They were quite attractive little cars that went well, examples of which are still around today. He incorporated in some of his cars his rather novel and unique suspension - which he tried unsuccessfully to sell to the main car industry - whereby the car was made to “lean” into the corner thus making the outside wheel “dig in”. This idea never caught on however. He also made a type of overgrown beach buggy called a Tripper, a name which apparently has unfortunate connotations in Germany. This very lightweight car could have various engines but when fitted with a tuned 2.5 ltr straight six Triumph engine was incredibly fast. These cars never caught the public’s fancy as the Electron Minor had and after a few years Torix moved on to other things. The Electron Minor has proved to be a force to be reckoned with in historic racing and driving tests alike, having won major championships and many trophies. If you would like to read about the full Fairthorpe story, buy the book by John Allan available from the club secretary ISBN 1-870519-39-6.